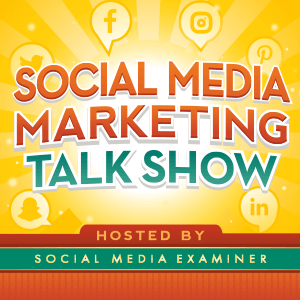 The Social Media Marketing Talk Show is the longest running weekly live video talk show dedicated to social media marketing. Discover the latest breaking news in social media marketing, brought to you by Social Media Examiner. Each week we bring you expert commentary on breaking social media marketing news from Facebook, Instagram, Twitter, LinkedIn, Snapchat, and Pinterest. You’ll gain quick insight that could provide a competitive advantage. Click here to RSVP for our next show. Click here for show archives. The show is distributed to Facebook Live, Periscope, and YouTube. You can also listen to the show as an audio podcast, found on iTunes/Apple Podcast, Android, Google Play, Stitcher, and RSS. See our schedule below. Click on any date for access details: Link to cal. download.